Website TheBrickFan.com confirms that the Darth Revan mini figure will be a May the Fourth give-away. Click through for more information. In many ways, the Star Wars "Saga" Jabba The Hutt (Jabba's Palace) Ultra figure is better than the 2010 Star Wars [Shadow Of The Dark Side] release. We are thoroughly impressed with this 2004 version's paint job and upper body sculpt and we don't think Hasbro has bettered it to date. Although based on 1999's Episode I Jabba Glob toy, many collectors don't even realize that this version has significant all-new parts. Learn all about this release for the first time, or again, in our Research Droids Reviews today. Be sure to leave your own thoughts in our comments section, vote in the poll or even leave comments about it on our Facebook page. Click the banner below for the direct link to the review! As always, you can also send your own personal review requests via email if you'd like to see something that we didn't cover yet. JTA sponsor Dorkside Toys is continuing to take pre-orders on the latest Star Wars figures at great prices. Click through for more! We are continuing to take a short break from the Power Of The Jedi line to delve into some Star Wars "Saga" stuff that we skipped over originally. Check out the Hoth Survival Accessory Set (With Hoth Rebel Trooper), a TARGET exclusive that may just be the worst of the bunch! See more in our Research Droids Reviews today. Be sure to leave your own thoughts in our comments section, vote in the poll or even leave comments about it on our Facebook page. Click the banner below for the direct link to the review! As always, you can also send your own personal review requests via email if you'd like to see something that we didn't cover yet. I have to say that I am flabbergasted by the hits, the comments, and the overall response to the 2002 Star Wars "Saga" TARGET exclusive Accessory Sets in the RDRs over the last couple of days. You would think that we were reviewing new figures or something. (I actually thought they were a little bit boring myself honestly.) Anyway, with special thanks to JTA reader and commenter Kraig M. for pointing this out, I have shot two images of The Black Series 6" Stormtrooper next to the Mouse Droid that comes with the Death Star Accessory Set. Although much too big for the 3.75" line, Kraig commented that it may be in scale with the 6" line. It can certainly be said that if this is true that these accessories, although "anachronistic" in 2002, were really ahead of their time. I am inclined to agree with him. But what do you think? Great Stuff Still Being Found At Five Below! Five Below reports are still coming in strong! JTA reader Brian writes in with a recent find. Check out what he had to say about his store find! We are continuing to take a short break from the Power Of The Jedi line to delve into some Star Wars "Saga" stuff that we skipped over originally. Check out the Death Star Accessory Set (With Death Star Trooper And Droid), a TARGET exclusive including an all-new Interrogator Droid and an all-new oversized Mouse Droid with a fun action feature! See more in our Research Droids Reviews today. Be sure to leave your own thoughts in our comments section, vote in the poll or even leave comments about it on our Facebook page. Click the banner below for the direct link to the review! As always, you can also send your own personal review requests via email if you'd like to see something that we didn't cover yet. Our friends at BanthaSkull.com are teasing an image and are advising readers that they'll probably want to check back after 6AM tomorrow morning. After you check out our RDR for the day tomorrow morning here at JTA, go and see what they have revealed. I tried asking what it was but Chris wouldn't tell me. (Jerk.) Anyhow, you have been advised. It's a slow news season, and this might be the most exciting story on any fan site in some time, well, maybe except for Jayson at Yakface.com adding a figure with more than five points of articulation to his Toyguide today! UPDATE: It's now available for you to view! Click HERE for more! The Black Series 6-inch Wave 3 sets are back in stock at Brian's Toys! A fresh new shipment from Hasbro has just arrived, and you can get a sealed case of four figures for only $79.99. The case includes Han Solo, Stormtrooper, Luke Bespin, and Obi-Wan Kenobi. Also, the Vintage stuff just keeps coming! This week there is a unique 20 Back Boba Fett available, 12-Back AFA figures, and a great selection of vehicles graded and ungraded. For more from this week's newsletter visit Brian's Toys! We are continuing to take a short break from the Power Of The Jedi line to delve into some Star Wars "Saga" stuff that we skipped over originally. Check out the Endor Victory Accessory Set (With Scout Trooper) which was released as a TARGET exclusive and includes an Ewok drum set made out of Imperial helmets! See more in our Research Droids Reviews today. Be sure to leave your own thoughts in our comments section, vote in the poll or even leave comments about it on our Facebook page. Click the banner below for the direct link to the review! As always, you can also send your own personal review requests via email if you'd like to see something that we didn't cover yet. Our friends at BanthaSkull.com have the scoop on a Darth Revan LEGO mini figure. Interested? Then click through for more! Darth Plagueis Continues To Arrive At Kmart! JTA reader Frank C. writes in to let us know that Kmart is still receiving the Darth Plagueis wave of The Black Series 3.75" line. Click through for his report! The Black Series 6" wave 3 continues to hit. New and novice JTA reader Dean writes in to let us know what he found. Click through for his report! What Are Your Opinions On JTA Focusing New Attention On Our Forums? We have received both posted comments and emails from readers asking about why we don't have forums. What may be embarrassing about these questions is that, in all actuality, we do have forums. The link for them can be found HERE. Sadly, it has been our recent position that forums are a dying breed. And often a lot of what gets posted in them is hostile, angry and generally negative. As we try to keep JTA an upbeat site (save for any conversations that surround the dreaded 5POA figures), you can understand why we have shied away from such a format. Before we promise anything (like revamping/restarting them), we would like to elicit your opinions on how you'd feel if JTA would start them up in a consistent manner. Would you join/become a member? Would you post consistently? Would you possibly be interested in moderating for us? (Because Chuck and I will have no time to stay on top of that.) We feel we have the strongest audience to date and it may be a good time to reconsider this option. There are some incredible forums already out there, and we're not looking to steal business. Many Star Wars fan sites have their niche, and in the past, clearly ours was NOT forums. Anyway, let us know how you feel about this. We don't want to take traffic away from our comments, but if we develop strong forums, maybe that won't matter at all. Let us know! Find out how you can win the "so far only available in foreign markets" running change The Black Series 41st Elite Corps Clone Trooper with an exclusive contest hosted by JTA and affiliate Order Sity Six Toys! Stay tuned for more details! We are taking a short break from the Power Of The Jedi line to delve into some Star Wars "Saga" stuff that we skipped over originally. Check out the Arena Conflict Accessory Set (With Battle Droid) which was released as a TARGET exclusive and includes a fun version of the red B1 Battle Droid, oh, and some cool accompanying accessories too. See more in our Research Droids Reviews today. Be sure to leave your own thoughts in our comments section, vote in the poll or even leave comments about it on our Facebook page. Click the banner below for the direct link to the review! As always, you can also send your own personal review requests via email if you'd like to see something that we didn't cover yet. When we discussed the carry-forward Bastila Shan figure, I also mentioned that I noticed a few differences on the Dak Ralter carry-forward figure too. We have done a similar comparison for you to hopefully illustrate what we believe has been changed on the Dak Ralter figure as well. Again, differences in lighting and processing of images can certainly alter how things are perceived by the human eye, but I am certain that both Bastila and Dak are NOT simply "carry-forwards" and that they definitely had some "work' done on them. But you be the judge in our comments. Click through for more. JTA affiliate ToyzMag.com alerts us that The Black Series 6" wave 3 has hit France! Click through for their report.. The Boba Fett (300th Figure) proves to collectors why super-articulation isn't everything. Its dynamic sculpt and gorgeous paint job make this a must-have figure from the Power Of The Jedi line. Check it out again or for the first time in our Research Droids Reviews today. Be sure to leave your own thoughts in our comments section, vote in the poll or even leave comments about it on our Facebook page. Click the banner below for the direct link to the review! As always, you can also send your own personal review requests via email if you'd like to see something that we didn't cover yet. The title of this article should be read with the same intensity as when C-3PO was having an identity crisis on Geonosis. Hasbro said this wasn't for us. They were correct about that. But it CLEARLY wasn't for the kids either. My local Toys R Us stores are literally drowning in unsold Angry Birds product. Perhaps Hasbro can reduce Saga Legends and Mission Series to zero points of articulation and see how much better they will perform at retail too. One thing is for certain. The cruel end of Angry Birds is near! And it would be nice if the other "kids lines" weren't too far behind these. Click through for more! Another TRU Item Has Gone Green! It's hard to compete with $29.00 MTTs at TJ Maxx and/or Marshalls, but it looks like TRU is following suit by putting the behemoth on "green" clearance. Keep letting us know what you're finding on "green" clearance folks! Special thanks to JTA reader Frank R. for the news and image. Click through for more! Spend May The Fourth At Rancho Obi-Wan! Celebrate “May the 4th” in the ultimate Star Wars environment…. Rancho Obi-Wan! No crowds of people, no lines, no hassles; just a fun day with other Star Wars fans. Starting today, for every donation Rancho Obi-Wan (ROW) receives of $10 or more, ROW will enter the donor’s name in an opportunity drawing. On April 4th ROW will draw 10 names and those donors will be invited to bring one guest to Rancho Obi-Wan on May 4, 2014 for an intimate celebration, including a guided tour of the museum with owner Steve Sansweet, lunch and other fun activities. Details can be found at our website HERE. No Need To Sell Us A Bridge - Sell Us What We Want To Buy! Well, this story hits close to home, but I just had to share it with you. My nephew has become inordinately obsessed with the Star Wars saga and (don't gasp) he has a particular fondness for Episode III. He has been begging my sister and her husband for a "crispy" Anakin Skywalker figure after seeing it in a book called The Ultimate Action Figure Collection at Mim and Pappy's house (my parents). Look at his reaction when my sister presented him with the long-awaited action figure from the Revenge Of The Sith line for his birthday. No need for 5POA, a budget line or cruddy paint operations. Kids want what kids want and parents will do what they have to do to get these things for them. Click through for more. Friend Matthew S. alerts me to more news of sports teams draping themselves in Star Wars themed uniforms. Now the Durham Bulls have something special planned for Star Wars Night on May the 4th. Click through for more. Here is the very first Clone Trooper action figure! Familiarize yourself with it again in our Research Droids Reviews today. Be sure to leave your own thoughts in our comments section, vote in the poll or even leave comments about it on our Facebook page. Click the banner below for the direct link to the review! As always, you can also send your own personal review requests via email if you'd like to see something that we didn't cover yet. Another week has passed and it’s time for Yakface.com's look back at the latest news in Star Wars collecting. On this episode of The Realm Recap they talk a lot about custom figures, vehicles and packaging, plus they discuss new case assortments for The Black Series, Ralph McQuarrie’s influence on the Star Wars “brand” and a certain “ol’ smoothie” shuffling his way to the dance floor. Click on through to check out the latest show. Feel free to subscribe to our channel and leave suggests on what you’d like to see covered (more or less) on the show. You Want A Nice Selection Of Star Wars Toys? Head To Switzerland! It seems that as time move on, foreign retail is the place to be for great Star Wars collectibles. Look what JTA reader Erik from Switzerland sends us as proof to what he can purchase at retail. You're making us envious Erik! Congratulations!! Click through for his report. Toys R Us Goes Green! You know from our earlier report that Toys R Us has begun a new discount program that green tags clearance merchandise. You may want to visit your local store if you know they have "old" product in stock. JTA reader Aarren A. from Davenport IA sends us proof that some pretty cool stuff is ringing up for pennies on the dollar! Click through for his report. JTA reader Jordan S. writes in to let fellow collectors know that The Black Series 6" wave 3 has hit the Orlando Florida area! Good luck everyone finding Stormtroopers out there! Click through for his report. It's been incorrectly assumed by many that the astromech droid R3-T7 was from a deleted scene in Attack Of The Clones when in actuality it can be seen in the film. See the proof in our Research Droids Reviews today. Be sure to leave your own thoughts in our comments section, vote in the poll or even leave comments about it on our Facebook page. Click the banner below for the direct link to the review! As always, you can also send your own personal review requests via email if you'd like to see something that we didn't cover yet. Sponsor Announcement: Dorkside Toys: Order TBS Wave 4 And More! 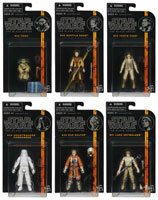 Pre-order the fourth wave of The Black Series 3.75" line and more at JTA sponsor Dorkside Toys! Click through for their latest newsletter! This is the very first Jango Fett action figure! See how Jango Fett (Sneak Preview) stacks up against the action figures designed with modern standards in our Research Droids Reviews today. Be sure to leave your own thoughts in our comments section, vote in the poll or even leave comments about it on our Facebook page. Click the banner below for the direct link to the review! As always, you can also send your own personal review requests via email if you'd like to see something that we didn't cover yet. I wish I could quote a line from Superstar that starred Molly Shannon and Will Ferrell. But (#1) I don't swear and (#2) it's not appropriate for this site. (Maybe I should have sent this story to a close affiliate site to post instead.) Sadly, it's the perfect comment to describe this Mission Series Han Solo figure. This means that you'll have to click through to see the mishap. Special thank to JTA reader and friend Jamie D. for sending this in to us! This is the last one! After a long wait the remaining episodes of Star Wars: The Clone Wars episodes have finally arrived via Netflix. Over the next thirteen days Mike Taber will be reviewing every episode of the brand new sixth season of Star Wars: The Clone Wars. We're sure that like us, you'll probably binge-watch all thirteen episodes at once but hopefully these reviews will be a nice companion for the final episodes and spur some discussion about them as well. The final episode is Sacrifice. FAIR WARNING! Spoilers are revealed. It is our belief that Zam Wesell (Sneak Preview) is one of the nicest and most detailed Star Wars action figures Hasbro has ever produced. See why we love her in our Research Droids Reviews today. Be sure to leave your own thoughts in our comments section, vote in the poll or even leave comments about it on our Facebook page. Click the banner below for the direct link to the review! As always, you can also send your own personal review requests via email if you'd like to see something that we didn't cover yet. The Sideshow 12" Commander Wolffe, Boba Fett Prototype Armor, and Darth Vader Deluxe are back in stock at Brian's Toys! Don't miss your change to pick these three great pieces up a second time around. Also new this week are the Imperial Emblem Bookends that will look great in any personal library. Also, tons more Vintage AFA figures have been added, including a Droids Sise Fromm, rare no offer ESB Luke (Hoth Outfit), and a 12-back R2-D2. The Captain America: The Winter Soldier will be hitting theaters soon, and Brian's Toys has a full-size shield replica available to sale! Don't go to a midnight showing without it! For more from this week's newsletter, visit Brian's Toys! Check Out The Running Change 41st Elite Corps And Please Vote Again! It's almost unbelievable, but Hasbro did indeed update the very boring 41st Elite Clone Trooper figure in The Black Series line. As you probably already know, we gave that figure one of the worst scores possible. (Many of our readers followed suit.) While not perfect, the revised figure is definitely a tremendous update. Sadly, at the moment there are no plans for this figure to arrive in the USA which will likely enrage many collectors. So we secured a sample for you to review (and another sample to be given away for a future promotion – details to follow) so that you can get a better idea of what this running change is all about. Most importantly, we ALSO cleared out the results of our voting poll. We'd ask that all of you who voted the first time to please revote on this figure based on how the variation looks now, not the debacle that was released earlier. Check out our revised photo gallery (36 total pictures now) and PLEASE cast your new vote in our poll! It's back! After a long wait the remaining episodes of Star Wars: The Clone Wars episodes have finally arrived via Netflix. Over the next thirteen days Mike Taber will be reviewing every episode of the brand new sixth season of Star Wars: The Clone Wars. We're sure that like us, you'll probably binge-watch all thirteen episodes at once but hopefully these reviews will be a nice companion for the final episodes and spur some discussion about them as well. The twelfth episode is Destiny. FAIR WARNING! Spoilers are revealed. Worst.... TBS Paint Job.... Ever! Watch out John Favreau! You've got nothing on this Leia! Look what very good friend and JTA reader Dale H. found at his local TARGET. It scared him all the way home! Click through for more! If you think Leia Organa (General) is a leftover from The Power Of The Force "2" line, you really aren't that far off the mark. See why it would have been better if Hasbro didn't release this particular version of her in the Power Of The Jedi line in our Research Droids Reviews today. Be sure to leave your own thoughts in our comments section, vote in the poll or even leave comments about it on our Facebook page. Click the banner below for the direct link to the review! As always, you can also send your own personal review requests via email if you'd like to see something that we didn't cover yet. JTA reader Oliver sends us another insane example of how retail has scrambled to salvage the remains of their own Bubblegate disaster. Click through for more! Darth Plagueis Wave Found At The Superstore In Canada! JTA reader Bobcat alerts his fellow Canadian collectors that The Black Series Darth Plagueis wave has hit The Superstore! Click through for his story! Here is a totally classic action figure from the modern line. Jek Porkins (X-wing Pilot) is a wonderful release in the Power Of The Jedi line. See why you need him in your collection in our Research Droids Reviews today. Be sure to leave your own thoughts in our comments section, vote in the poll or even leave comments about it on our Facebook page. Click the banner below for the direct link to the review! As always, you can also send your own personal review requests via email if you'd like to see something that we didn't cover yet. It's back! After a long wait the remaining episodes of Star Wars: The Clone Wars episodes have finally arrived via Netflix. Over the next thirteen days Mike Taber will be reviewing every episode of the brand new sixth season of Star Wars: The Clone Wars. We're sure that like us, you'll probably binge-watch all thirteen episodes at once but hopefully these reviews will be a nice companion for the final episodes and spur some discussion about them as well. The eleventh episode is Voices. FAIR WARNING! Spoilers are revealed. File Under: Will This Never End? Again, you just never know what you may find at retail, especially if that retailer has not taken the necessary meaures to alert its stock computers that The Black Series is a completely DIFFERENT line! Obviously a return, people should not be able to use their TBS receipts to bring back unwanted "TVC TPM" products! Geesh! Special thanks to JTA reader William G. for the report! Click through for more. Although K-3PO (Echo Base Protocol Droid) may have one of the nicest paint applications we have ever seen, the sculpt isn't that great because Hasbro resued the TC-14 sculpt from the Episode I line. See why it doesn't meet our complete expectations in our Research Droids Reviews today. Be sure to leave your own thoughts in our comments section, vote in the poll or even leave comments about it on our Facebook page. Click the banner below for the direct link to the review! As always, you can also send your own personal review requests via email if you'd like to see something that we didn't cover yet. High Resolution Images Of Latest TBS Figures! Our friends at Rebelscum present the first un-watermarked/unadulterated set of high resolution Hasbro images of The Black Series figures recently revealed by Hasbro. If you're looking for a pure view of Hasbro's own images, without a claim to different ownership smacked on them, you know where to go. Check them out!! You just never know what you're going to find at retail. How about a Power Ranger in place of Odd Ball? That's what JTA reader _mosh found. Click through for his story! Our friends at Yakface.com have an incredible story to share about a military reader of theirs. It almost reads like fiction, but it's an incredible tale of bravery and honor. Check it out!! Episode VII is confirmed to take place 30 years after Return Of The Jedi. Reuters.com has the story! Did you know that 2001's POTJ Zutton (Snaggletooth) figure isn't Zutton? His real name is Zutmore. And he even used to be called Rachalt Hyst. We're not kidding. For years, Star Wars fans have been royally confused by the various Snivvians. Don't be so ethnocentric. Get the facts regarding these characters straight. We outline it all in our Research Droids Reviews today. Be sure to leave your own thoughts in our comments section, vote in the poll or even leave comments about it on our Facebook page. Click the banner below for the direct link to the review! As always, you can also send your own personal review requests via email if you'd like to see something that we didn't cover yet. Our friends at BanthaSkull.com are reporting that there is a new HasbroToyShop.com discount code. Click through to find out what it is! UPDATE: The code is now expired. We have our sample on the way to update our RDRs from the UK (so far it is not confirmed for a USA release yet), but JTA Spanish reader PackoM sends us a great set of quick pics to share with our readers of the running change variant of the controversial The Black Series 41st Elite Corps Clone Trooper! Click through to see the great comparison images! Two (2) Shae Vizla Action Figures On Clearance? Sure! JTA reader and friend from NZ madezra has an incredible tale to tell. Not only did he find TWO (2) Shae Vizla action figures at his local store in New Zealand. He also found them on clearance! Click through for his story! Last Dance For Billy Dee Williams? JTA reader Scott W. writes in and provides a little more evidence surrounding the mystery of the arrival of the TAC R2-D2 & C-3PO Celebration IV figures at Five Below. Would you believe that they are arriving with Celebration stickers and contact information from 2007 on the cases? Where in the depths of Hasbro's warehouses were these cases resurrected? This is a great example of when a company can be penny wise/pound foolish. Has they sold these for $10 a piece instead of $20 a piece, they likely wouldn't have had a fraction of this leftover stock. Now retail is only getting $5 a pop, which means that Hasbro got A LOT LESS from Five Beklow buyers! Click through for more! Big Bad Toy Store posts their latest pre-orders and new arrivals. Click through to see what's new! You can also get daily product news and updates by subscribing to BBTS's Facebook page and Twitter feed! It's back! After a long wait the remaining episodes of Star Wars: The Clone Wars episodes have finally arrived via Netflix. Over the next thirteen days Mike Taber will be reviewing every episode of the brand new sixth season of Star Wars: The Clone Wars. We're sure that like us, you'll probably binge-watch all thirteen episodes at once but hopefully these reviews will be a nice companion for the final episodes and spur some discussion about them as well. The tenth episode is The Lost One. FAIR WARNING! Spoilers are revealed. It was part of the final wave of the Power Of The Jedi line, and it also happened to be the very first R4 unit in the entire basic figure line. The all-new sculpt of R4-M9 is very good, but did you know that there was a running change to this figure as well? Find out more in our Research Droids Reviews today. Be sure to leave your own thoughts in our comments section, vote in the poll or even leave comments about it on our Facebook page. Click the banner below for the direct link to the review! As always, you can also send your own personal review requests via email if you'd like to see something that we didn't cover yet. Power Of The Jedi - You Asked, We Listened! The response to the Power Of The Jedi Research Droids Reviews has been incredible so far, and we just delved into this line. I have already received multiple requests to pose the original Kenner figures next to their POTJ updates (if it applies). I should obviously have known better that this would be desired. Anyway, I updated the reviews we have already posted, and future updates will include these comparison pics. We will also be providing comparison pictures for older POTF2 versions as well if they apply. Thank you for your feedback. JTA sponsor Dorkside Toys writes in with new announcements of new arrivals, pre-orders and clearance items. Check them out! It's back! After a long wait the remaining episodes of Star Wars: The Clone Wars episodes have finally arrived via Netflix. Over the next thirteen days Mike Taber will be reviewing every episode of the brand new sixth season of Star Wars: The Clone Wars. We're sure that like us, you'll probably binge-watch all thirteen episodes at once but hopefully these reviews will be a nice companion for the final episodes and spur some discussion about them as well. The ninth episode is The Disappeared – Part II. FAIR WARNING! Spoilers are revealed. Starting today through midnight St. Patrick's Day Monday, March 17th, 2014, K & C Collectibles is offering 15% off all in-stock merchandise for those orders over $35.00. The discount coupon is "Green2014" and must be keyed into the Redemption Code field during the check out process. Offer valid while supplies last. K & C Collectibles has Black Series Wave 3 in-stock, Mission Series Wave 2, Saga Legends Wave 2, more LEGO sets and much more. Here is the very first Fans' Choice winner: Ellorrs Madak from the Power Of The Jedi line. Learn about how it won in our Research Droids Reviews today. Be sure to leave your own thoughts in our comments section, vote in the poll or even leave comments about it on our Facebook page. Click the banner below for the direct link to the review! As always, you can also send your own personal review requests via email if you'd like to see something that we didn't cover yet. Not much in the way of Hasbro news this week but Flyguy and Yakface.com hash out the bevy of LEGO news that has been assembled, chat a bit about The Clone Wars on Netflix (no spoilers) and discuss their recent acquisitions. Click on over to YouTube to check out the latest show. Feel free to subscribe to their channel and leave suggestions on what you’d like to see covered (more or less) on the show. JTA French reader Dimitri writes in with visual proof that the running change The Black Series 41st Elite Corps Clone Trooper has hit Toys R Us in France! Click through for his report! Amazon.com has the Republic Attack Shuttle for half price right now. That's $45 with free shipping. Click through to take advantage of this deal! A big thanks goes out to JTA reader Keith for alerting us to this discount! An all-new version is coming in The Black Series later this year, but see this character's roots in the basic action figure line as we analyze Darth Vader (Dagobah) (which is really a dark spirit instead of actually Darth Vader or Luke Skywalker) from the Power Of The Jedi line. This and more awaits you in our Research Droids Reviews today. Be sure to leave your own thoughts in our comments section, vote in the poll or even leave comments about it on our Facebook page. Click the banner below for the direct link to the review! As always, you can also send your own personal review requests via email if you'd like to see something that we didn't cover yet. Check out the Lili Ledy Jawa over at Brian's Toys! This figure is one of the rarest Lili Ledy Jawas as it has an attached hood. Brian's Toys has uploaded an HD video to show off the figure an describe it's condition. Also new this week are pre-orders for a new GIANT 31-inch 501st Clone Trooper, which will make a great corner piece in anyone's collection. Also, several Sideshow Sixth Scale figures are being restocked next week, including the Deluxe Darth Vader, Boba Fett in Prototype Armor, and the Commander Wolffe. Get your pre-orders in for those now. It's back! After a long wait the remaining episodes of Star Wars: The Clone Wars episodes have finally arrived via Netflix. Over the next thirteen days Mike Taber will be reviewing every episode of the brand new sixth season of Star Wars: The Clone Wars. We're sure that like us, you'll probably binge-watch all thirteen episodes at once but hopefully these reviews will be a nice companion for the final episodes and spur some discussion about them as well. The eighth episode is The Disappeared. FAIR WARNING! Spoilers are revealed. 6-Inch The Black Series Stormtrooper Wave Hits TARGET! We told you that it's showing up at Toys R Us, now JediDefender.com has reported via their Twitter page that wave 3 of The Black Series 6" line is now hitting TARGET. Looks like the hope of getting that Stormtrooper is becoming a bit stronger! 2007 Exclusive Figure Set Makes Its Way To Five Below! In what vaccuum did these get stuck? As first reported by Imperial Holocron on Twitter and then questioned by our friends at Yakface.com, we can also confirm another report of the 2007 30 (77-07) R2-D2 & C-3PO exclusive figure two-pack at Five Below. For those of you who need to know WHY you need this, check out our RDR on this beautiful set RIGHT HERE. Friend and JTA reader Michael H. sends us proof! Click through for his report. Send In The Clowns For The Black Series At Retail! When will Hasbro grasp that all is not right at retail? How can they sell their products when things are basically in complete disrepair? Does Hasbro just really only care about how much stuff they sell to Big Box retail, regardless how much the public actually buys? Don't they send out reps anymore to groom the aisles to report back what isn't going well? Look how much JTA reader Chris' Walmart is charging for 3.75" The Black Series figures. It's downright outrageous. This store probably saw nothing beyond wave 1 either! Break out the calliope and blare Entry of the Gladiators because this is a circus! Ten years ago today that was JTA's first headline and kicked off our coverage of the Star Wars Universe! At 11AM on March 14th, 2004 Jedi Temple Archives officially opened our virtual doors. Since then we've grown more than we could have ever imagined. A big thanks goes out to all of our readers, sponsors, and staff past and present who keep coming back and who keep us motivated! How fitting that the day before our tenth anniversary we break the 100K mark on Alexa.com's web site ranking. This marks our 13,294th story on our front page... that's an average of over 3.5 stories a day for ten years! It's hard to believe that when we posted that first story that we would ever make it this far. Thanks again everyone! Another gorgeous figure from the Power Of The Jedi line is Tessek. Hasbro has captured this Quarren quite perfectly, but again, you can't judge the figure by its articulation. See more in our Research Droids Reviews today. Be sure to leave your own thoughts in our comments section, vote in the poll or even leave comments about it on our Facebook page. Click the banner below for the direct link to the review! As always, you can also send your own personal review requests via email if you'd like to see something that we didn't cover yet. It's back! After a long wait the remaining episodes of Star Wars: The Clone Wars episodes have finally arrived via Netflix. Over the next thirteen days Mike Taber will be reviewing every episode of the brand new sixth season of Star Wars: The Clone Wars. We're sure that like us, you'll probably binge-watch all thirteen episodes at once but hopefully these reviews will be a nice companion for the final episodes and spur some discussion about them as well. The seventh episode is Crisis At The Heart. FAIR WARNING! Spoilers are revealed. Stop by and check out the latest from Big Bad Toy Store. You can also get daily product news and updates by subscribing to BBTS's Facebook page and Twitter feed! There has been much discussion on who the Season 6 clones are that will be coming forth soon in The Black Series line. JTA reader darth maul is confident he has the answer. Click through for his thoughts on this. You will be able to see this clearly in my image, but I should preface this first with saying that the color difference is strikingly pronounced in person, more than what this image shows. I came across a very bizarrely colored Luke Skywalker (Ceremonial) figure which makes me question if something might have changed in production, or if this is a "yellow" figure's answer to "turning yellow" just as all those white clone troopers did. Check it out and let us know what you think. My very first figure didn't have this noticeable difference between the arms and the vest. But now I am seeing this, the third sample in 2 weeks. Catch Up On The Black Series 6 Inch Figures On Amazon.com! Amazon.com currently has a large selection of The Black Series 6 Inch figures for less than $15, many of these with free shipping with Amazon Prime. If you have been waiting to pick some of these up now might be the time to catch them at a reasonable price. A big thanks to Scott from Tulsa for the heads up! Jedi Temple Archives Breaks 100K On Alexa! Jedi Temple Archives has, for the first time ever, reached a goal today that we are thrilled to share with you. Because of you, our zealously awesome readership, we have broken the 100K mark at Alexa.com. Alexa ranks over 200 million sites against each other. Per Alexa, "The global traffic rank is a measure of how a website is doing relative to all other sites on the web over the past 3 months." While this can certainly change in the future, we wanted to document that the goal was indeed reached. Again, thanks needs to go out to all of you because without you this wouldn't have been possible. While some others may rely on falsifying stats like buying YouTube views, Facebook likes or Twitter followers, that's just something we cannot do. Thank you for your support and we are honored that you rely on us for the latest Star Wars news, reviews and other Star Wars information. The figure with the greatest number of articulation points is FX-7 (Medical Droid) from the Power Of The Jedi line. It's so perfect that it still holds up and we believe it will never age. In fact, Hasbro recently repainted this figure and placed it in the TARGET exclusive Special Action Figure Set 9-pack. See why you MUST own this figure in our Research Droids Reviews today. Be sure to leave your own thoughts in our comments section, vote in the poll or even leave comments about it on our Facebook page. Click the banner below for the direct link to the review! As always, you can also send your own personal review requests via email if you'd like to see something that we didn't cover yet. It's back! After a long wait the remaining episodes of Star Wars: The Clone Wars episodes have finally arrived via Netflix. Over the next thirteen days Mike Taber will be reviewing every episode of the brand new sixth season of Star Wars: The Clone Wars. We're sure that like us, you'll probably binge-watch all thirteen episodes at once but hopefully these reviews will be a nice companion for the final episodes and spur some discussion about them as well. The sixth episode is Rise Of Clovis. FAIR WARNING! Spoilers are revealed. JTA reader George Starr writes in to let us know he received his allotment of 10 The Black Series 6" Stormtrooper figures. They arrived today from HasbroToyShop.com. If you were fortunate enough to grab these online, expect your order shortly. Click through for a larger image. We've been hard at work behind the scenes adding tons of enhancements and improvements to our Research Droids Reviews database! One of our big additions is an all-new Quick Search page where you can jump straight to grouped results from the RDR database. With over 1,750 highly detailed reviews this helps narrow down exactly what you are looking for, and all the related products surrounding that collectible! So what are you waiting for, go play with our new feature! Here we go! It's POTJ time! We open the line up with what may be one of the greatest Hasbro Star Wars action figures of all time: not for its articulation, but for its sculpt, screen accuracy and undeniably perfect paint job. Revisit Amanaman (With Salacious Crumb) with us in our Research Droids Reviews today. Be sure to leave your own thoughts in our comments section, vote in the poll or even leave comments about it on our Facebook page. Click the banner below for the direct link to the review! As always, you can also send your own personal review requests via email if you'd like to see something that we didn't cover yet. It's back! After a long wait the remaining episodes of Star Wars: The Clone Wars episodes have finally arrived via Netflix. Over the next thirteen days Mike Taber will be reviewing every episode of the brand new sixth season of Star Wars: The Clone Wars. We're sure that like us, you'll probably binge-watch all thirteen episodes at once but hopefully these reviews will be a nice companion for the final episodes and spur some discussion about them as well. The fifth episode is An Old Friend. FAIR WARNING! Spoilers are revealed. JTA sponsor writes in with the latest arrivals, pre-orders and clearance items. Click through for more! The Clone Wars Episode Chronology Revealed! With special thanks to our friends at GalacticHunter.com for alerting us to this, Leland Chee has revealed the chronological order of ALL The Clone Wars episodes, something that has been bugging fans for a while to know. See GalacticHunter.com's story. Our friends at StarWarsFiguren.com have a great image bank of photos of the recently revealed The Black Series and Mission Series figures, most of which you have seen before. Click through for the necessary links. I thought I would "never" get through the Star Wars "Saga" figures but thankfully that goal was reached today (well, except for maybe a few repacked figures). A very good but large line, it was filled with awesome figures, but many left something to be desired. Thankfully, beginning tomorrow I will be delving into one of my personal favorite all-time basic figures line, the Power Of The Jedi line. The packaging was certainly mediocre at best, but it was the very first collection that housed everything under one banner: the Original Trilogy, the Expanded Universe and The Phantom Menace and what's especially nice is that Hasbro gave us a fair representation of all the various sources. Plus, we all got some amazing figures as well. I also know for a fact it is a favorite collection amongst many of my colleagues. We will be mixing up the daily reviews to stretch out POTJ as long as possible, so be sure to join us as we dive in head first with some of POTJ's best. It all begins tomorrow! Please note that some Disqus users are experiencing trouble when viewing their comments. This has affected some of my comments and threads as well as those by our readers. Please note that we haven't deleted comments and that we have a ticket into Disqus to see if this can be resolved expediently. Luke Skywalker (Bespin Fatigues) In Stock At HTS! The long lost Luke Skywalker (Bespin Fatigues) 6" figure finally shows up on Hasbro Toy Shop! After all of those Stormtrooper sales, they probably have a bazillion to go through now! StarWars.com has an awesome article by Dave Filoni thanking fans of The Clone Wars and present exclusive unused concept art from the series. Special thanks to JTA readers Paul B. and Mike T. for directing our attention to this article! FOUND! The Black Series 6" Stormtrooper Wave At Toys R Us! Did you miss the limit of 10 per customer of HasbroToyShop.com's The Black Series 6" Stormtrooper like we did? Don't worry! They are arriving RIGHT NOW at Toys R Us. Yours truly just found the complete wave outside of Princeton, NJ. (You-know-who: this isn't a -1 for my ration!) Click through for the proof! For Scott, our own Luminara lover, we present Luminara Unduli (Jedi Master) from the Star Wars "Saga" line, our final basic figure to review from the 2002-2004 Star Wars "Saga" era. Is she worth it? Decide for yourself in our Research Droids Reviews today. Be sure to leave your own thoughts in our comments section, vote in the poll or even leave comments about it on our Facebook page. Click the banner below for the direct link to the review! As always, you can also send your own personal review requests via email if you'd like to see something that we didn't cover yet. The Black Series: What Is Coming, In What Color Packaging, And When! Now that these new images have been publicly revealed for wave 4 of both The Black Series 3.75" lines and 6" lines, we wanted to refresh your memory of our exclusive Toy Fair report of how and when these figures will be arriving: in what style packaging and in what part of 2014. Are you interested in a quick refresher course? Then click through for details! It's back! After a long wait the remaining episodes of Star Wars: The Clone Wars episodes have finally arrived via Netflix. Over the next thirteen days Mike Taber will be reviewing every episode of the brand new sixth season of Star Wars: The Clone Wars. We're sure that like us, you'll probably binge-watch all thirteen episodes at once but hopefully these reviews will be a nice companion for the final episodes and spur some discussion about them as well. The third episode is Orders. FAIR WARNING! Spoilers are revealed. E-tailer Andrews Toys have posted loose and carded images of some upcoming TBS 3.75" and 6" figures. "Yikes!" is about all we can say. Check them out on our Facebook page, where we have shared their images for our readers, visual proof to the story you only saw at Jedi Temple Archives! There is also evidence of both the Bastila Shan (#20) and Dak Ralter (#25) repacks in TBS packaging, but we are waiting for visual confirmation of that to share with you as well. As you may or may not know, Kmart is going through another reorganization and corporate is closing even more stores around the nation. (Two local Philly stores are closing also as part of this initiative.) JTA reader Leland N. reports on a similar situation in his area and alerts reader to something you may want to know. Click through for more. We initially had reservations, but the Clone Trooper Deluxe line is turning out better than we ever expected. Perhaps the best so far is the Clone Trooper Deluxe (501st) figure which is a tremendous update to the 2010 release. See why this is so in our Research Droids Reviews right now. Be sure to leave your own thoughts in our comments section, vote in the poll or even leave comments about it on our Facebook page. Click the banner below for the direct link to the review! As always, you can also send your own personal review requests via email if you'd like to see something that we didn't cover yet. It's back! After a long wait the remaining episodes of Star Wars: The Clone Wars episodes have finally arrived via Netflix. Over the next thirteen days Mike Taber will be reviewing every episode of the brand new sixth season of Star Wars: The Clone Wars. We're sure that like us, you'll probably binge-watch all thirteen episodes at once but hopefully these reviews will be a nice companion for the final episodes and spur some discussion about them as well. The third episode is Fugitive. FAIR WARNING! Spoilers are revealed. Eager JTA reader Lorne C. snaps a "selfy" with his recent and awesome Darth Plagueis find at Walmart. Walmart's Star Wars stock is so extraordinarily unpredictable, you just have to go and see what the store did (or didn't) receive in stock. Congrats Lorne! Lorne writes that he found two (2) of these at his local store! Unbelievable! We initially had reservations, but the Clone Trooper Deluxe line is turning out better than we ever expected. Today we look at the Clone Trooper Deluxe (Veteran) figure which give 1:6 Scale Figure collectors the best Episode II and Episode III clones possible. See why in our Research Droids Reviews right now. Be sure to leave your own thoughts in our comments section, vote in the poll or even leave comments about it on our Facebook page. Click the banner below for the direct link to the review! As always, you can also send your own personal review requests via email if you'd like to see something that we didn't cover yet. It's back! After a long wait the remaining episodes of Star Wars: The Clone Wars episodes have finally arrived via Netflix. Over the next thirteen days Mike Taber will be reviewing every episode of the brand new sixth season of Star Wars: The Clone Wars. We're sure that like us, you'll probably binge-watch all thirteen episodes at once but hopefully these reviews will be a nice companion for the final episodes and spur some discussion about them as well. The next episode is Conspiracy. FAIR WARNING! Spoilers are revealed. LEGO Sandcrawler Formally Announced And Revealed! LEGO formally announces their awesome Sandcrawler and provides accounts a detailed look at this mammoth, Click through to visit the gallery on our Facebook page!! Click through for the official PRESS RELEASE. JUST ADDED: a video of this awesome release! Amazon.com currently has the The Vintage Collection Star Wars Action Figure Set (Droid Set) for $5.99. This is a great price for three figures, especially if you are looking to pick up extras! Thanks to Paul Hoffman for alerting us of this current deal. Well, thanks to our readers we pretty much determined that these Imperial Officer characters can only be found in Episode V and Episode VI only. Learn more in our Research Droids Reviews as we go over both versions of the Star Wars "Saga" Imperial officer figure. Here is Version 2. Be sure to leave your own thoughts in our comments section, vote in the poll or even leave comments about it on our Facebook page. Click the banner below for the direct link to the review! As always, you can also send your own personal review requests via email if you'd like to see something that we didn't cover yet. A giant selection of wonderful Star Wars Vintage AFA items have been stocked on the Brian's Toys website! Over 50 graded items are for sale, ranging from 12-backs to Power of the Force. There is even an incredibly rare Chewbacca 12 Back-A figure which features a one-of-kind "SKU on Figure Stand" variant. Also new this week are two new Clone Troopers to join the Sixth Scale Sideshow line, the 501st Clone and Veteran Clone. Both are reasonably priced and make great additions to any 12-inch collection. It's back! After a long wait the remaining episodes of Star Wars: The Clone Wars episodes have finally arrived via Netflix. Over the next thirteen days Mike Taber will be reviewing every episode of the brand new sixth season of Star Wars: The Clone Wars. We're sure that like us, you'll probably binge-watch all thirteen episodes at once but hopefully these reviews will be a nice companion for the final episodes and spur some discussion about them as well. Season six kicked off with the episode "The Unknown", and what a great start it was! FAIR WARNING! Spoilers are revealed. OK. We NEED YOU to prove us wrong. We don't believe that this particular style of Imperial Officer appeared in A New Hope, so Hasbro's sourcing of this figure is incorrect. Hasbro photo-shopped out the ranking badge on Childsen (from Episode IV) on the packaging, but we have only been able to find these utility-outfitted officers with no badge in The Empire Strikes Back and Return Of The Jedi. If you disagree, please let us know in our comments. Learn more in our Research Droids Reviews as we go over both versions of the Star Wars "Saga" Imperial officer figure. Here is Version 1. Be sure to leave your own thoughts in our comments section, vote in the poll or even leave comments about it on our Facebook page. Click the banner below for the direct link to the review! As always, you can also send your own personal review requests via email if you'd like to see something that we didn't cover yet. Our friends at Rebelscum.com would call this a "totally ridiculous" auction and they would be right. Click through for the craziness! Special thanks to Darth Chuck for the alert! The long lost short film Black Angel that accompanied The Empire Strikes Back in theaters has been found. Yahoo.com has the full story! The jury is still kind of out about the R2-D2 (VC25) figure from The Vintage Collection. With the new smaller scale and wonky features (some will work in one mode but not others for example), R2-D2 was still good, but not perfect. JTA reader and friend Jamie D. from Canada discovered something quite interesting with this figure and has created a video to illustrate that R2-D2 isn't as limiting as once perceived. You may find new affection for him even! Click through to see a video describing what he's learned!! This is the figure you probably don't know about that has two variations. As stated yesterday, there were actually three (3) versions of the Rebel Trooper (Tantive IV Defender) figure released in the Star Wars "Saga" line. With the Power Of The Jedi version that total goes up to four. We would probably bet our collections that you'll learn about a new version of the figure that you didn't know about previously in our Research Droids Reviews as we go over these figures. Here is Version 2, which interestingly has two (2) versions! Be sure to leave your own thoughts in our comments section, vote in the poll or even leave comments about it on our Facebook page. Click the banner below for the direct link to the review! As always, you can also send your own personal review requests via email if you'd like to see something that we didn't cover yet. What The TBS Mara Jade Could Have Looked Like! Do you want to see what The Black Series Mara Jade figure was supposed to look like? Our friends at Yakface.com have the production blueprints of the figure to share with everyone. Check it out! Look Ma! It's A Clone... Wait! Storm.... Wait! It's A Clormtrooper! It's universally accepted that the figures from the Saga Legends line invoke nightmares at bedtime with their horrific paint operations (unless you're Jayson Krebsbach, then you just buy them for the SECOND time and open them), but now things have taken an all-new turn for the worse. (Of course this is likely just a one-off mistake. I just needed a new reason to bash my good friend.) However, you better check your figures carefully before buying them. You can see the error in the thumbnail below if you have eagle eyes, but if you need a clearer explanation, then click through for the latest drama of the all-time highest ranking debacle in the Star Wars line to date: the new and "de-improved" Saga Legends line. Did you know that there were actually three (3) versions of the Rebel Trooper (Tantive IV Defender) figure released in the Star Wars "Saga" line? With the Power Of The Jedi version that total goes up to four. We would probably bet our collections that you'll learn about a new version of the figure that you didn't know about previously in our Research Droids Reviews as we go over these figures. Here is Version 1. Be sure to leave your own thoughts in our comments section, vote in the poll or even leave comments about it on our Facebook page. Click the banner below for the direct link to the review! As always, you can also send your own personal review requests via email if you'd like to see something that we didn't cover yet. Our friends Jayson Krebsbach from Yakface.com and Flyguy from Flyguy.net have begun an informative and entertaining new weekly podcast entitled The Realm Recap. Join us in our support for this new endeavor and catch yourself up with some of the key announcements and rumors that abound in the collecting community week by week. We're a bit behind, so our inaugural post will contain links for their first four episodes. This podcast comes highly recommended by JTA. Be sure to give it a test drive. Amazon.com Slave I Price Fluctuations, Keep Checking Those Prices! Keep checking Amazon.com if you are still in the hunt for the Amazon exclusive Slave I. Today it dropped back down to $69.99 for a short while before going back up. If you still need this it is worth checking daily to see if you can lock it in at a lower price. At this time is has gone back up to $100+. A big thanks to JTA James Cole for letting everyone know about tthe price drop! Tomorrow's Daily Deal from Entertainment Earth is 35% off of the Star Wars Sandtrooper on Dewback Animated Maquette Statue. That's a $140 savings on this high-priced item, plus free shipping! If you were looking to pick this up this might be the best deal you will find. Big Bad Toy Store has posted their latest newsletter. Be sure to check it out for all of the latest updates. You can also get daily product news and updates by subscribing to BBTS's Facebook page and Twitter feed! Lando Calrissian To Be A Contestant On Dancing With The Stars! Our own Lando has been confirmed as a contestant on Dancing With The Stars. Special thanks to friend Rich A. for the alert! (Send me what I need NOW!) See the full scoop at Today.com! An interesting image of a LEGO Sandcrawler has popped up on the web! Check it out! All we can say is "wow". The Boba Fett (Prototype Armor) figure is beyond our expectations. Released 600 days apart from Sideshow's very first 1:6 Scale Boba Fett figure, see why you need this one in our Research Droids Reviews today. Be sure to leave your own thoughts in our comments section, vote in the poll or even leave comments about it on our Facebook page. Click the banner below for the direct link to the review! As always, you can also send your own personal review requests via email if you'd like to see something that we didn't cover yet. See, you don't have to buy 30K Fakebook and Twitter fans to make yourself look bigger than you are. No, all you need is wit, charm and a lot of hard work, no matter if you're big or small to get noticed. We're proud of our friends and affiliates at BanthaSkull.com who thanks to a famous actor have made an incredible mark in their history as a site. Click through for more! Did you know that Eeth Koth was supposed to fight in the Battle of Geonosis, but the actor who played him couldn't make it to those specific filmings? As a result, Agen Kolar was born. We're already off track, but see why Eeth Koth (Jedi Master), the slight repaint from the Power Of The Jedi line, is likely based on Agen Kolar's fighting scenes rather than his own Jedi High Council scenes in both Episode I and Episode II. It's all in our Research Droids Reviews today. Be sure to leave your own thoughts in our comments section, vote in the poll or even leave comments about it on our Facebook page. Click the banner below for the direct link to the review! As always, you can also send your own personal review requests via email if you'd like to see something that we didn't cover yet. I wanted to quickly post this before The Walking Dead comes on, so this is going to be short and sweet. My local Walmart is a total waste. This is a super center mind you. The Star Wars section couldn't be any thinner and all that's starting at me are Biggs Darklighters and some old Mission Series sets. The new Saga Legends and other cool figures are actually in the clearance aisle. Go figure! What do your stores look like? JTA sponsor Dorkside Toys writes in with the latest news, pre-orders, clearance items and deals! Click through for more!! Hasbro did an "about face" with their approach to Ewoks beginning with Teebo from the POTJ line. It was so good that they reissued him as the final figure with a few unintentional tweaks in the Star Wars "Saga" line, but it just didn't get distributed that well. See Teebo slightly revised in our Research Droids Reviews today. Be sure to leave your own thoughts in our comments section, vote in the poll or even leave comments about it on our Facebook page. Click the banner below for the direct link to the review! As always, you can also send your own personal review requests via email if you'd like to see something that we didn't cover yet. Back in January, we reported that we noticed a distinct running chnage on the Saga Legends Stormtrooper's brim. Now JTA reader Jason M. found one of these in the wild and has posted an image of it in our comments. I am now featuring this image on our front page to better illustrate this new change or variation. As reported earlier, the brim is closer the the visor, which will make this version very controversial to many collectors. Click through for more! Friend and JTA reader Josh M. decided to get a little creative with the Saga Legends Stormtrooper figure, or at least a part of it. Admittedly, it looks pretty darn good. Click through to see what he did! More Hasbro Star Wars merchandise is hitting Tuesday Morning discount chains. Special thank to JTA reader Ziro the Hutt for the news. Click through for more! 12th Parsec Ewok Hut Playset Update! The fine folks over at 12th Parsec have sent us an update on their totally amazing Ewok hut fan-made playsets. Click through to see what they have to say, and about how well they're doing with their campaign! Just more proof for you, and as a follow up to the first store report find at Yakface.com, our readers are also now sending proof that the MTT is being found across the country at TJ Maxx and Marshalls for as low as $29.00 and as high as $39.00. If your store still has these red-stickered at $59.99, your markdown is coming VERY SHORTLY. For details on this, check out our investigative report HERE! Click through for JTA reader Keith K.'s report! We post the news and then the store reports come flooding in! JTA reader Paul H. The Lesser confirms finding Star Wars: Frames for a song. Click through to read his report! Dorkside Toys Contest: Winner(s) Announced! Thanks to all that participated in our Dorkside Toys contest! They have picked the winner, but the entries were so good that they had to select a runner up as well! Click through to see who won! To my surprise at multiple Toys R Us locations today I found The Black Series 6" wave 1 in heavy quantities. Is the backlog coming through, or do you think these are reshipping? If you missed any of these figures, you may wish to check your local Toys R Stores. Click through for the proof.